The image I want to discuss today is one of those *zingers* that captures people's attention. The cleavage probably has something to do with it, but more than that I feel it is the sense of motion and action that brings the eyes over to see what is going on. Our image today features Cambriea, probably my most photographed model and someone I have worked with since I got into photography. I am completely obsessed with hair in my photos, especially the long type. So much can be done with it and when it is in motion, you can really hear the choir of angels singing. Often I use fans, or a good breeze, but sometimes you resort to the "hey, whip your head around real fast and don't fall over" technique. Today we are using 4 lights, and this is my first run using my new Einstein strobes from AlienBees.com. I am really happy with them and can't recommend them enough. 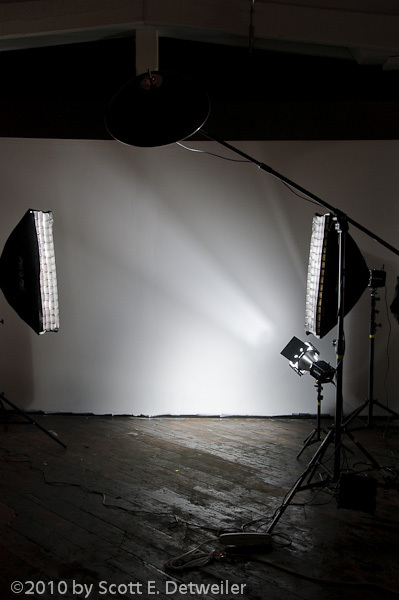 Our key light is a large reflector (22") made of stainless steel. The AlienBee people call this their Laser Reflector, but basically it works like a silver beauty dish. I have this over the model and slightly in front of her. Off to either side are small strip boxes with 40 degree grids to help keep the light off of the background. Behind the model and camera right is another strobe with a barn-door modifier on it aimed at the white wall. I did this just to create a bit of visual interest rather than just having a flat gray surface. I even remembered to take a shot of the lighting setup. It really takes the magic out of the illusion as you can see the meager environment in which it was shot. Basically a plain white wall and about 10'x10' of floor space was all that was required. Posing consisted of "...do that again and again until you are almost ready to fall over" series of hair flipping. The directive of "get your arms out" is the only other piece of advice I had for her. Overall I think 10 of the 80 turned out well and will probably fiddle with those someday. Well as you can tell we have more work here than one would probably expect. First we have some physical *oddities* that have occurred due to the swinging of the arms and head to create the dynamic image. So, using liquify we need to adjust her "ladies" so they are even as well as take that bump off the waistline of the shirt on the pants camera right. The neck on camera left was pushed forward by her shoulder while turning, so that looks all wonky and needs to be addressed as well. The model is also self conscious of her arms because mom has apparently given her some DNA she would rather give to someone she hates. So, to please her we will push those in a bit to keep her happy with the image. No one wants to hear "gee, I look fat in your photo". Next we need to do as the title insinuated and add some hair. I borrowed most of her from another image and then masked off all the hair on the right side and added it to this image. We can then easily mask out her hand and then work on blending the two rats-nests into one happy condo of hair. Most of this was done with a typical mask and some additional painting of hairs using colors local to where the blending was problematic. The finishing touch was the addition of the background texture. I used one of the Flypaper Textures as I like the quality and usability of them. This is the "soft light" blending mode being applied to the image of the steel like texture. I did go back and mask out her body and most of the hair as the texture was not something that looked good in this case, so it was removed. I also created a curve layer and set it to "hard light" and masked in only her hair. This will really push up the highlights so I ultimately lowered the opacity down to a believable level. In the end your goal should be an image that does not appear to have been retouched. You will notice she does not have skin made of plastic or weird glowing eyes (not like you can see them in this image). To often I see skin smoothing gone horribly wrong or people that overwork the eyes. Just keep the realism goal at the top of the list and you will always produce great work. Damn good tips, as always! Thanks for giving us a peek at the wizard behind the curtain.